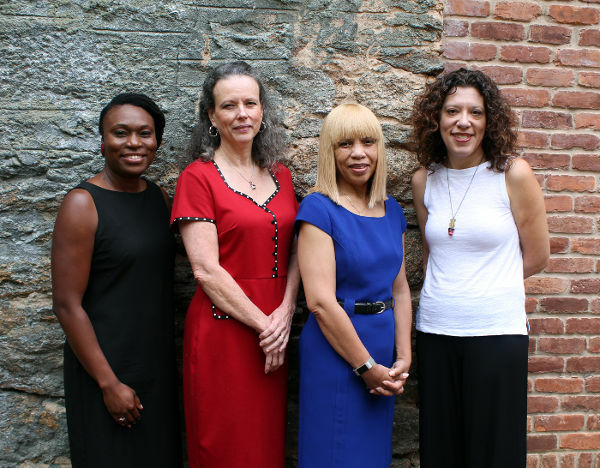 (L-R) Zoe Johnson, director of Field Education at UGA School of Social Work; Anna Scheyett, dean and professor at UGA School of Social Work; Valerie Bell, executive director of Athens Regional Library System; Jennifer Elkins, associate professor of Social Work at UGA School of Social Work. Not pictured: Donna Brumby, assistant director for Organizational Development at Athens Regional Library System. The Athens-Clarke County Library has just received a grant from the Institute of Museum and Library Services (IMLS) to partner with the University of Georgia School of Social Work to become a trauma-informed library. The Library Community Catalyst Grant is part of the IMLS’s National Leadership Grant program. IMLS has awarded the library $150,000 through the grant – one of only 12 awarded nationwide this year out of 51 applications. The library and university will establish a program to place social work student interns at the library to identify specific needs of at-risk community members, and to share information about social services while advocating for those who have difficulties accessing services. The internships are set to begin in October. Scheyett added that the grant-funded partnership will enable the Athens-Clarke County Library to become the first specialized trauma-informed library in the state and one of a few in the nation. The partnership aims to address issues of societal disenfranchisement and female childhood trauma, by establishing a two-pronged project that will empower young girls, while moving the Library toward a trauma-informed environment. The project will also include an after-school program that teaches leadership skills to teen girls, including written and oral communication, relationship building, conflict resolution and teamwork. Establishing a peer-mentoring program at the Library will help address some of the issues at-risk young women face. “By establishing a trauma-informed staff, we hope to create a space where all members of the community feel respected and empowered to connect,” said Bell. According to the IMLS, the Community Catalyst Initiative challenges museums and libraries to transform how they collaborate with their communities. It achieves this by testing and developing approaches for bringing about positive change by drawing on the unique relationships, knowledge and spaces of museums and libraries. It also encourages the exploration of partnerships with other organizations, including local nonprofit and community development organizations. The Athens-Clarke County Library is the headquarters of the Athens Regional Library System. Serving residents in Athens-Clarke, Franklin, Madison, Oconee and Oglethorpe counties, the library system was named 2017’s Georgia Public Library of the Year. The Athens-Clarke County Library is located at 2025 Baxter Street, Athens. To learn more about library programs and services, call (706) 613-3650 or visit www.athenslibrary.org. Founded in 1964, the University of Georgia School of Social Work generates new knowledge through research and prepares social work practitioners through classroom instruction and community-based internships while emphasizing the integration of social justice in all social work practice. For more information on the School of Social Work, see ssw.uga.edu. The Institute of Museum and Library Services is the primary source of federal support for the nation's libraries and museums. We advance, support, and empower America’s museums, libraries, and related organizations through grantmaking, research, and policy development. Our vision is a nation where museums and libraries work together to transform the lives of individuals and communities. To learn more, visit www.imls.gov and follow us on Facebook at www.facebook.com/USIMLS and Twitter @US_IMLS.